Welcome to the November 2012 issue of our Family Games Treasurehouse newsletter. We want to especially welcome any new subscribers since our last newsletter. 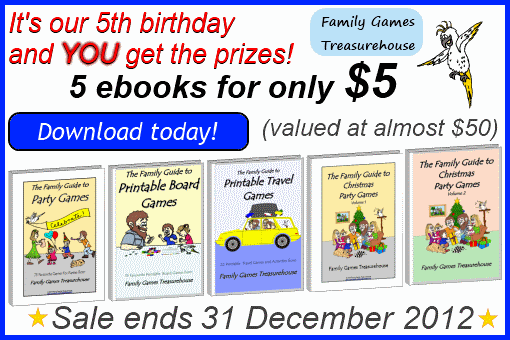 It's hard to believe but Family Games Treasurehouse is five years old! That's right, our website started from humble beginnings in November 2007 until our position today with over 300 family friendly games that are great for building strong, healthy relationships. See below for our fantastic deal to celebrate our birthday. YOU get the prizes! The holiday season is almost here, and everyone is gathering for celebration after celebration. Thanksgiving Day is a time to get together and be thankful for all the blessings you have received over the last year. Families and groups may like to celebrate Thanksgiving with these special party games. I'm Thankful For ... is an easy Thanksgiving Day game that is good as an icebreaker or while sitting around the meal table. One player chooses an item they are thankful for. It could be a favourite person, food, pet, toy, place, etc. The remaining players take turns trying to guess the item by asking questions that can only be answered by "Yes" or "No" (similar to the parlour game Twenty Questions). Thanksgiving Charades is a more active game that is still easy to play. One player chooses an item they are thankful for, similar to the game above. This time, the player must (silently) act out their item while the remaining players try to guess what it is. The first player to correctly guess then has a turn to mime their own favourite item. Corn and Spoons is a Thanksgiving variation of the old party game, Egg and Spoon Race. Players line up in teams and have to run to a marker about ten yards/metres away and return to their team while carrying a teaspoon with a pile of corn on it, handing the teaspoon to the next player, and so on. If a player drops any of the corn, they must return to the start line and run the course again. As part of our 5th birthday celebrations, we are offering an incredible deal in our "Fifth Birthday Ebook Special". We have recently published three new ebooks and are offering them together with our popular "Family Guide to Party Games" and "Family Guide to Christmas Party Games Volume 1" for a HUGE saving off the normal price. Yes that's right. Five ebooks for only $5. You get all 5 ebooks listed below for the low price of just $5. "Family Guide to Party Games"
"Family Guide to Christmas Party Games Volume 1"
"Family Guide to Christmas Party Games Volume 2"
"Family Guide to Printable Board Games"
What a bargain! With almost two hundred games and activities, it's incredible value. If you bought them separately they would cost $48.85 but we are offering them as a special deal to celebrate our 5th birthday. downloading them here. Don't delay! This deal ends on 30 November 2012. Finally, click on the image/link below to find out how you too can break the '9-to-5' routine by starting your own website that can earn you money and give you more time to enjoy with your family.